Today marks the annual celebration of World Entrepreneurs’ Day, #WED. A day set aside to create awareness for entrepreneurship, innovation and leadership throughout the world. 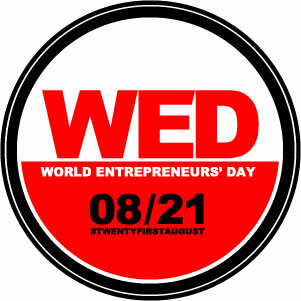 WED as it is called is the day of founders, managers, producers, contractors, industrialists, innovators, administrators, designers and producers. It is basically a day to celebrate the people who start a business ‘alone’. innovation, creativity, design, entrepreneurship and other related topics. Press members and media are also suggested to provide coverage within their publications for articles, news and interviews regarding entrepreneurs and their success stories. Fortunately, that is the aim of my blog! To celebrate this year’s #WED, i conducted a vox pop. I asked entrepreneurs to share a thought: “The Gains of Being an Entrepreneur” Here were the responses i got! Enjoy! You get to create value, transform your environment, be the positive change you want to see around you, and of course make a profit by solving peoples problems, by that, I mean you get rich! You set yourself in a position to learn and stay on top of your game. You learn something new from people around you and also get to see the competition and the challenges that abound. These will force you to maintain a standard which will cause you to be respected, or otherwise. You face challenges that mould you to become a stronger and better person. As an entrepreneur you are your own boss, you dictate the trends and how u want your business to go. Being Independent and having the right connections. The joy of being independent. You are independent, you call the shots and can work things to suit the kind of business you want or operate. You have no limits to growth or what you can achieve.